Winning tournament games in Art of War 3 requires you to take special conditions into account and adopt the certain playstyles independently from standard World War battles. -Allies have built up the defensive line. But sitting on the sidelines won’t work. While the defense is holding, gather the strength to destroy the enemy. Goal: Destroy the enemy base. -Your base, protected by AI ally’s wall and other defensive structures. -Enemy’s base, also protected by his AI ally defenses. 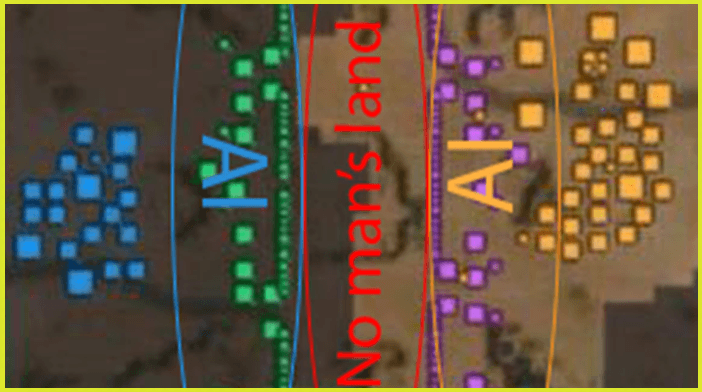 -No-man’s-land, the space in between two bases, highly dangerous but important area, holding some important strategic points as well as snatching supply caches. Tip No1: Plan for mid to late game immediately. Build no more than one Barracks and then put everything you got into building Supply Centers and just enough Power Plants for the Supply Centers to be Able to work. However, you cannot fall behind in upgrading Headquarter, otherwise, enemy can (and probably will) create tons of Aeroplanes or Artillery, and demolish you before you have a chance to respond. Tip No2: Build few infantry units and immediately send them to No-man’s-land. Avoid enemy defensive structures while searching for supply caches, grab those and when you are sure no other is available, move to your side of the map and search the Caches there. Tip No4: Send the starting units to the corner of the map where enemy Wall is touching the end of the map (outside of enemy defense range). Start destroying it, and if the enemy is careless he will send more then he needed. This is an ideal opportunity to observe what kind of army is he operating with. Once you see it, build enough units to counter that specific setup, but don’t overdo it. Just make sure to have enough units and developed buildings so you can produce more when the time is right. Tip No5: Rush your technology toward Artillery type of units, Torrents, and Mammoths. As soon as you have few, send it with other units to the strategically important spots, high ground from which you can hit enemy defense structures. Start the barrage and force the enemy to send something to deal with you. -The alternative is Aeroplane rush. Produce 8 jet fighters, then send 1 up front to scout enemy base so you know what to target. Immediately after that, send the rest of the 7 fighters, but not directly across instead, send them to the side of the map and cross to the enemy territory there. The reason for doing this is to limit the exposure to an enemy air defense structures. Once on the other side, try to control them in such way planes don't come near Enemy AI. Tip No6: Don’t forget to develop technology/buildings for production a new and more powerful part of your army (third tier of Assault or Special vehicles). You will need something strong to push through the defensive line while taking some beating. Tip No7: Remember that artificially controlled defenses will not be repaired, rebuilt or maintained in any way, shape or form. Protect yours, and keep scratching at enemies defenses. Little by little... what is important here is not to lose units to it, in another word: Don't overextend or commit to hard. Tip No8: One of the best ways to penetrate enemy AI is to have mixed army of Artillery (Torrent/Mammoths), Aeroplanes and 2nd/3rd tier Assault vehicles( Hammers, Armadillos, Zeus, and Jaguars). With ground forces destroy air defense systems. Once that is done, send in the planes to finish it off. Once technology goes past the Artillery point, the game can go either way and make predictions is not really possible. One additional tip is universal, and it is important in any game, but in this tournament, there are special circumstances. Scouting. For any kind of scouting to take place, you need aviation, be it helicopters or jet-fighters. If you send helicopters (don't ever send just one, you may need one to sacrifice in order for other to make it to the other side). Gathering information on enemy army composition and building upgrade level is crucial in this game, more so because scouting is very difficult to execute so everyone is susceptible to all kind of surprises. In the end, winning tournament games earn you a Skill point and how you spend those is the subject for another day. Hope you like this guide and have use of this. Now go on and win some games, enjoy the game and have fun.